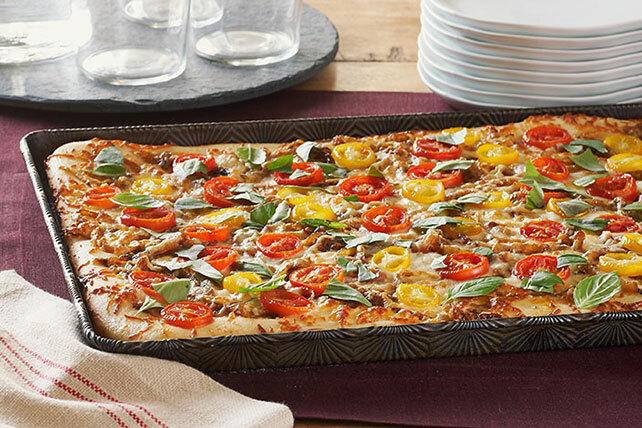 Caramelized onions and fresh tomatoes top this cheesy, crusty baked pizza. Sprinkle with torn basil for extra color and flavor. Cook onions in butter in large skillet on medium-high heat 15 to 20 min. or until onions are tender, stirring occasionally. Add dressing; cook on medium heat 10 min. or until onions are caramelized, stirring occasionally. Cool completely. Heat oven to 450ºF. Press Perfect Parmesan Pizza Dough onto bottom of 15x10-1-inch pan sprayed with cooking spray. Let stand 10 min. Top with onions, cheese and tomatoes. Bake on bottom oven rack 17 to 18 min. or until crust is golden brown. Tear basil; sprinkle over pizza. Make every last bite delicious by spreading toppings right to the edges of the crust. Freeze remaining Perfect Parmesan Pizza Dough until ready to use as desired. Onions can be cooked ahead of time. Refrigerate or freeze up to 3 months. Bring to room temperature before using.